The Dragons of Tarkir Game Day weekend was one of a kind. Out of the four Game Day events I attended, three of them attracted a crowd larger than the average PPTQ in my area. Game Days have never been that popular, nor that competitive. The weekend also set the record for the most Game Days I’ve ever played for a single set. Bow before the might of the Regent, in full art. Back at the Fate Reforged Game Day, the coveted prize was the Game Day Champion playmat featuring Chris Rahn’s alternate art of Ugin, the Spirit Dragon. The playmat sold for $80 on eBay during the weeks following the event, and is now selling for $30 to $50. 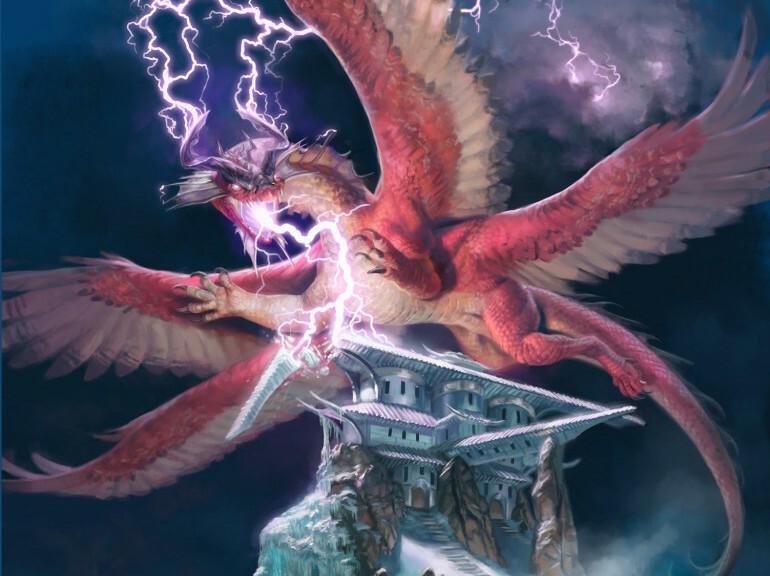 The expected value for participating in Fate Reforged Game Day was not spectacular, as only one person could win the playmat and sometimes tiebreakers can be heartbreaking. 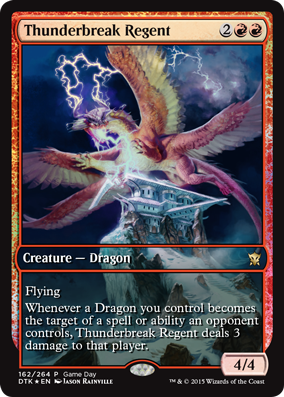 The Game Day Thunderbreak Regent is still commanding a TCGplayer-mid of $20 as of writing. If you took Derek Madlem’s advice and made top eight of your local Game Day, you would most likely have made a good return for your participation fee. 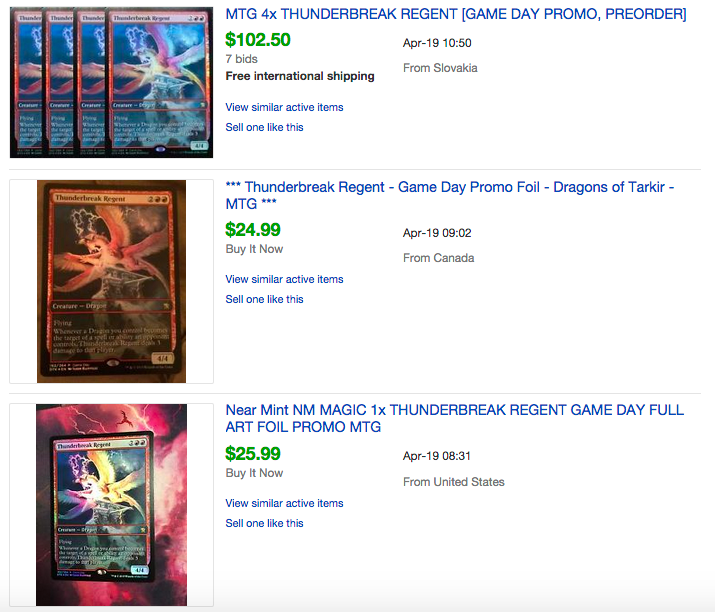 The price of the foil full-art Thunderbreak Regent got me wondering: is it one of the most expensive Game Day promos ever to the given out? They are limited edition and in limited in supply as only eight players per Game Day receive copies. A large majority of them seems to cater to the casual and EDH crowd, which means good long-term potential. Full-art foils are more collectible than set foils. Barring a few, Wizards has done a great job in ensuring that the art for the Game Day top eight promos blows the set version’s art out of the water. Chances of being reprinted: 0.05%. Those four factors put together make for solid long-term potential. Does that mean that these promos are good investments? Let’s have a look at how the first several Game Day full-art foil promos have done over the years. While the first Game Day to hand out a promo to its participants was the Tenth Edition Game Day back in 2007, the first Game Day that set the current trend for awarding a promo to each participant and another foil full art promo to the players who made top eight was the Magic 2010 Game Day. We shall start from this point. 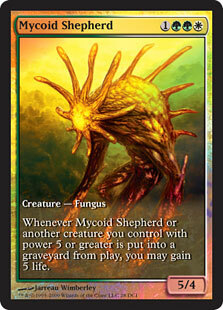 Even though Mycoid Shepherd was the first full-art Game Day promo, it is worth nought. The foil full-art Mycoid Shepherd is just going for $3.64 on TCGplayer. 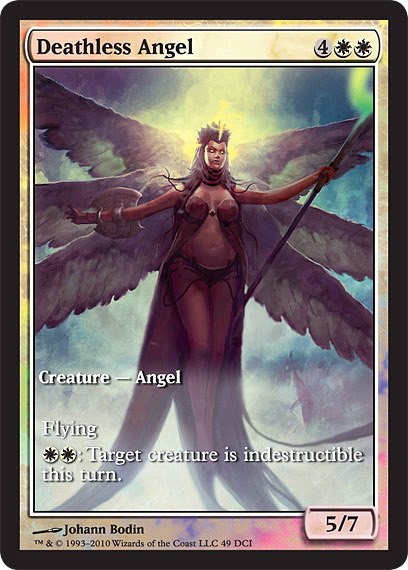 The Game Day promo (still called WPN or Gateway promo back then) full-art foil of Emeria Angel is commanding a TCGplayer-mid of $20 today, which is impressive and yet not really that surprising. She is an angel after all, and being a limited-edition foil featuring full art by none other than Steve Argyle could not hurt her price, even after being out of Standard for four years and not seeing play in Modern. I’m tempted to say that the casual force is strong in this one. However, the set foil is only $3. Could the fact that this Game Day promo features a full art drawn by a well-loved artist explains large chasm between the set foil and the Game Day foil? 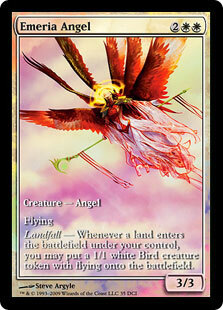 More importantly, could the Thunderbreak Regent Game Day promo follow the footsteps of Emeria Angel? The Worldwake Game Day top eight promo is another that remains moderately valuable today. The full-art foil Kalastria Highborn has a TCGplayer-mid of $11.84, but near mint copies start at $14.08. As limited edition cards get older, near mint copies become harder to locate. Contrast the Game Day full-art foil of Kalastria Highborn with the set foil, which is only $4.60. The difference between the set foil and Game Day top eight full-art foil may be less stark than that of Emeria Angel due to both versions sharing the same art, and vampires not being as popular as angels. 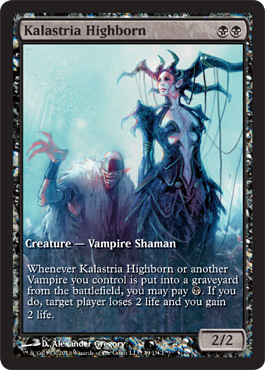 Vampires may not be a legitimate archetype in Modern, but the tribe has moderate casual and EDH appeal and Kalastria Highborn is a key piece of any vampire tribal deck. By the way, the set foil has a multiplier of only 0.56 compared the non-foil. Someone at Wizards was slacking at his or her job. We get another Game Day promo with the same art as the set version, albeit in full art glory and in foil. The Deathless Angel Game Day promo is only worth a TCGplayer-mid of $7.33, not much more than its set foil counterpart, which is going for $3.76. Deathless Angel may be an angel, but her ability is underwhelming, and I am not sure she is at all popular. Off the top of my head, I can only think of one deck that would want Deathless Angel: Kaalia of the Vast EDH. And there are much better ways to protect Kaalia. The trend of underwhelming Game Day top eight promos continued into the Magic 2011 Game Day. 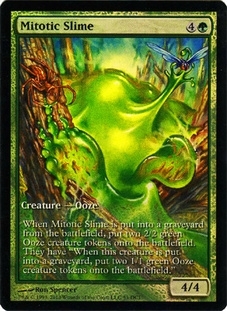 The only explanation I can think of for the reason behind selecting Mitotic Slime as the promo for this one is its perceived casual appeal. I can only imagine the collective disappointment of the players who made top eight of the Magic 2011 Game Days. At least Wizards commissioned a different art for the Game Day promo this time. Still, it’s barely worth anything, with a TCG-mid of $2.98. Now that’s a card worthy as a Game Day top eight promo! Tempered Steel was the centerpiece of its namesake deck which propelled four pilots, all from Team ChannelFireball, into the top eight of Worlds in 2011. The Tempered Steel archetype went on to become one of the premier aggro decks during that Standard season. 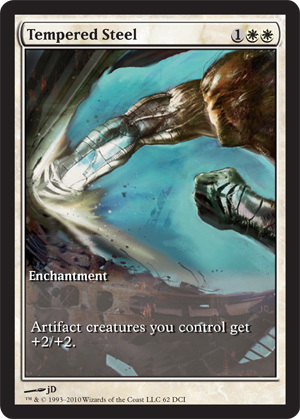 Unfortunately, since Scars of Mirrodin dropped out of Standard, Tempered Steel has struggled to find a home. It is too clunky for Modern Affinity, and it does not really fit the bill of a casual all-star. This all explains the Game Day full-art foil version of Tempered Steel being at a paltry $4.21 TCGplayer-mid. The Memnite non-foil full art promo, which was given out to all participants of the Scars of Mirrodin Game Day, is worth nearly as much as the promo exclusive to top eight players, with a TCGplayer-mid of $3.83. The next Game Day top eight promo recently experienced a hike in price, due to the recent surge in Tiny Leader’s popularity. The Game Day full-art foil promo Black Sun’s Zenith was hovering around $6 late last year, and spiked to the double digits early this year when a new format exploded into mainstream Magic. For a while, every single Magic content website featured discussion about the novel format that is Tiny Leaders. 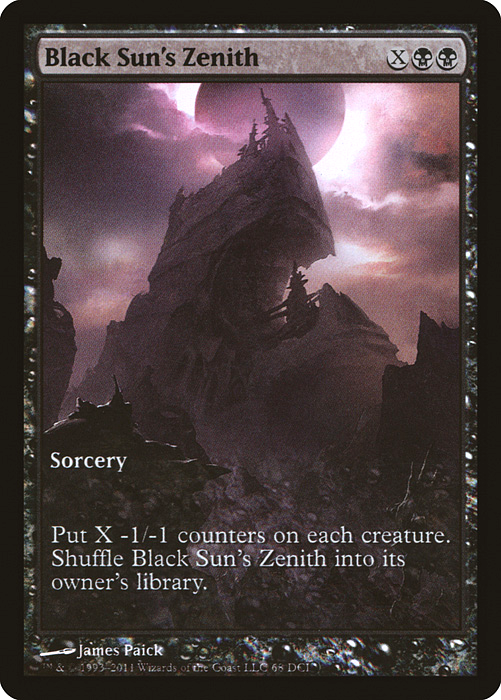 Black Sun’s Zenith is one of the rare few board wipes that is legal in Tiny Leaders, as its XBB casting cost qualifies it as having a converted mana cost of two. Black Sun’s Zenith’s Game Day full-art version is currently priced at a TCGplayer-mid of $14.48, making it one of the more expensive Game Day promos out there. The set foil is only $6.37. The Game Day Black Sun’s Zenith’s price is buoyed mainly by Tiny Leaders. It is not used in Modern, and there are better board wipes in EDH like Damnation (or Decree of Pain and Life’s Finale if, like me, you can’t afford Damnation). The Game Day full-art foil Black Sun’s Zenith also has one of the sweetest full-art treatments in existence, with an epic depiction of the onsetting despair of getting your board wiped by an opposing Black Sun’s Zenith by James Paick. That is all for today’s adventure back in time. Join me for future discussions of Game Day promos, as we will be continuing on our journey exploring the beautiful full-art cards given out to worthy players in the past few years. Feel free to leave your comments below, or catch me on Twitter at @theguoheng. Gracing us with free articles…much nicer of you. I haven’t been playing competitive magic that long (since Gatecrash) and the Game Day promos have been pretty pathetic until Thunderbreak. If Supplant Form isn’t the worst I don’t know what is. Was Hall of Triumph a Game Day promo or a Prerelease achievement? Hi Spencer, sorry for the late reply, it was a hectic week for me. Yeah, I don’t recall seeing a Game Day promo that was not pathetic since I started playing competitively during Innistrad. Here’s a hope that future Game Day promos will be on par with Thunderbreak Regent. The promo Hall of Triumph was a weird one. It was given out on top of the normal Game Day promos as part of completing the Hero’s Path quests. Though shopkeepers could just hand them out at their discretion.